I have just the basic addition, so I can’t comment on the extensions. I played the physical game once then bought this game. I read the rules, and the guide that comes up while you play makes it really easy to learn. 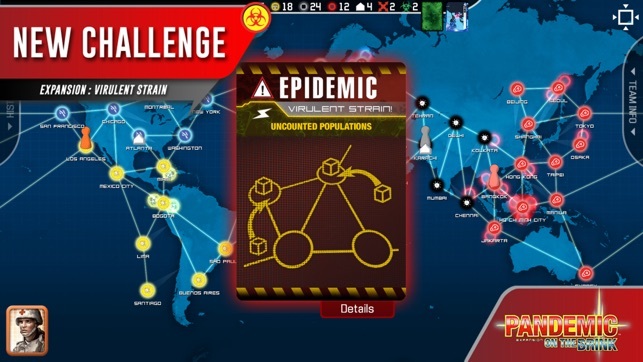 (When you start the game you chose your team, difficulty and “Info Mode” for the person who forgot how to turn this off) You have to plan your moves ahead, to the extent that you can, and realize just about every country just infected will be in again about 5 turns after an epidemic., I find keeping the infection under control usually works best, even if it means racing around the board to do so, and putting off turning cards until the end. I am still playing this allot a couple of years now. It lets u retract a move up until you draw cards. Unless you exit the game mid turn. This might make u relax , but it doesn’t let u always retract plays of say air card as it goes right into infection. 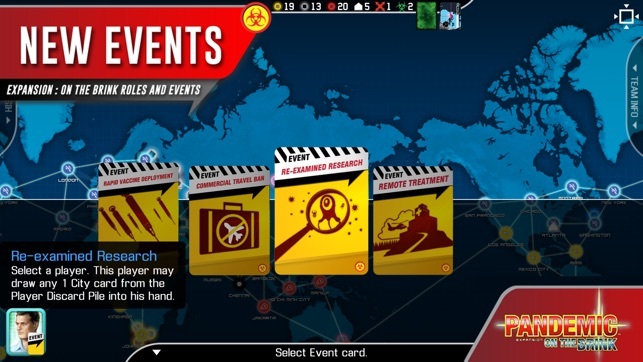 Also it lets u play shuffle card before the epidemic cards have been returned to the deck, which in almost all cases would be a complete waste. Still any retraction option is very nice. There is a small bug where the player info panel on the right does not display. 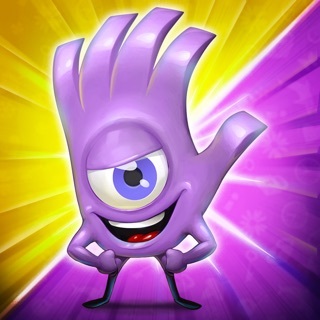 I used to shut down my iPad to fix this but found if u exit the game not the app, and resume it fixes this. I agree with all the great reviews. Well worth the money and best on a tablet. 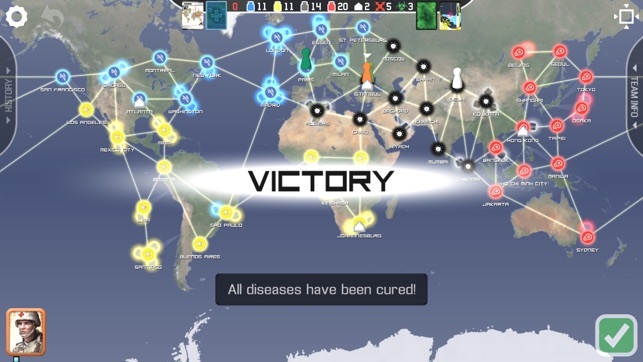 Suggestion: Could you add an option after "Victory" to continue the game until all four diseases are eradicated? 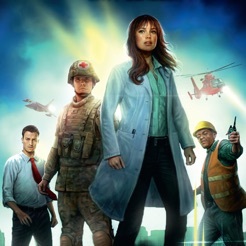 That's what we do with our board game at home because none of us feel like we've won when there is still a massive epidemic in Dehli, Lagos AND Kinshasa AND Khartoum AND Johannesburg are threatening quadruple outbreak, and kids are dying in the streets of Beijing, New York, Paris, and Taipei. We reshuffle the city cards (we do not include any epidemic cards), and we continue infecting after each turn (shuffling when deck runs out). 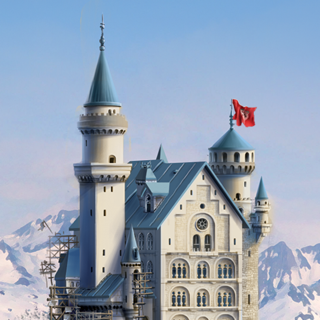 It can take as long as the original game (45 min), but it is so satisfying. As we approach the end of the game, we say, "Meet you in" whatever the closest research station is "for ice cream" or Martinelli's or whatever our celebratory food on hand is. And we clear the board and sit back knowing we have saved humanity. It always feels so false to see "Victory" on a screen where people are still obviously dying. Just a suggestion. Great game. 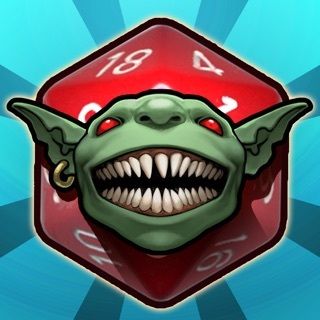 Great app version of the board game! 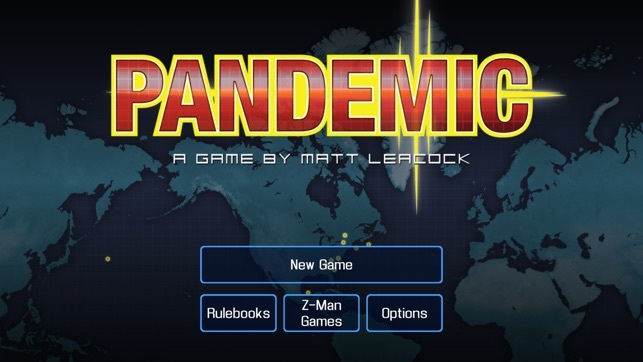 I really enjoy the board game version of Pandemic and was more than willing to pay for the app when I discovered it. 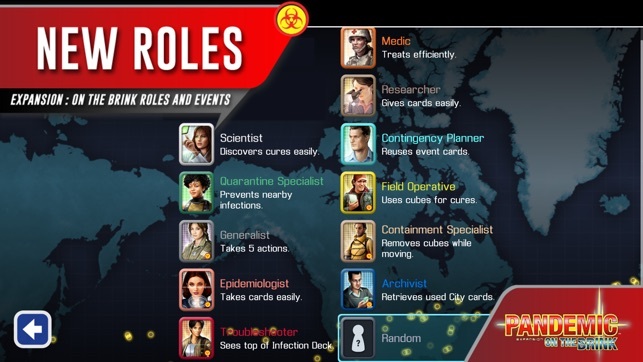 A note to frustrated players saying the card draws are not random.... in the board game, when an epidemic card is drawn, a new infection card is drawn for a potential outbreak. Then all the discarded infection cards are shuffled and placed back on the top of the draw pile. This makes the chances much higher you will draw a city that is already at risk. It does make game play challenging, but adds excitement as well, in my opinion. Well done to the creators on this one. I can't seem to put down my phone now that I don't have to set the whole board up whenever I want to play. The only changes I would like are to be able to utilize more than 4 characters per session and occasionally the player card cache icon on the right side of the screen will close and not reopen during game play. The icon is still visible, but if I hit it nothing happens. Other than that I am one satisfied fan!